The Junior World Championships 2017 continued on Thursday as 186 judoka chased world honours at the Dom Sportova in Zagreb, Croatia. Day two saw 112 men and 74 women compete across the -66kg and -73kg categories and the -52kg and -57kg categories. 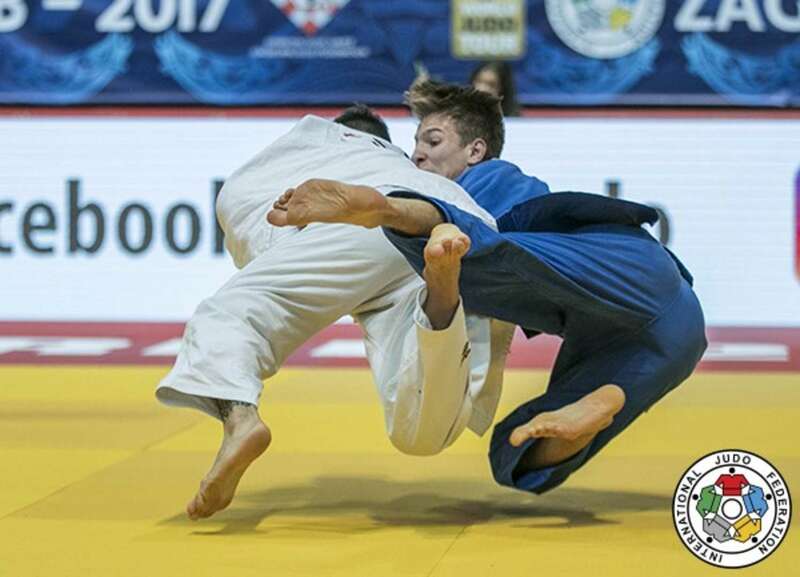 While the future stars of the IJF World Judo Tour are in action in Zagreb this week, the international judo community is gearing up for one of the highlights of the calendar next week as #WorldJudoDay 2017 will take place on Saturday 28 October. IJF Hall of Famer Mr. YAMASHITA Yasuhiro, who is now the All Japan Judo Federation President and IJF Development Director, is more than familiar with this year's theme of Courage having displayed one of judo's core values throughout his illustrious career. There was one defining moment in the legendary Japanese's career that immediately comes to mind when thinking of the #WorldJudoDay 2017. At the Los Angeles 1984 Olympic Games, YAMASHITA suffered torn calf muscle in his match against Arthur SCHNABEL (GER). Despite the injury he fought on and won gold at his only Olympic Games. "The Japanese team did not go to the 1980 Olympics which meant that I lost a chance to go to the Olympics," said judo's all-time great. "This was my only chance in 1984 to go to the Games and I was so ashamed when I suffered the injury at such at important event which was the biggest moment of my life. Ever since I watched the Tokyo 1964 Olympics when I was a boy I had a dream of being an Olympic and winning the gold medal. "Since that time I did everything in my power to realise my dream. In Los Angeles it was a very difficult time for me but I never gave up on my dream. I overcame the injury to win the gold medal and it was the greatest moment of my life. "The lessons I gained from judo have served me well in my daily life and this moment is what I am known for the most even to this day. These values of our sport are taken into society and in my career there was always challenges but I was able to show courage to accomplish everything that I desired. "I can say that the experience of the 1984 Olympics has made my life what it is today. Here in Zagreb, these young judoka will go through many emotions and hard moments and what I look for is for them to show courage because running away does not solve any problems and you will never realise you goals this way. You have to show courage to confront your challenges and take one step at a time. "After their competitive judo career, they will continue to take the lessons from judo into their daily life and, if a lot of judoka can show this, then judo is able to develop societies and enrich the lives of many people." Who does not know that name, Kano, especially in the judo world? Without Master Jigoro Kano, the sport simply would not exist, since in 1882 he created judo when he was only 22 years old. 135 years later, judo became a major Olympic sport and Paralympic sport and an educational tool for the youth of the world. While constantly evolving, it has remained committed to the values that Kano has defined. During the summer, the International Judo Federation had the privilege of meeting the grandson of the great man, Mr. Yukimitsu Kano. 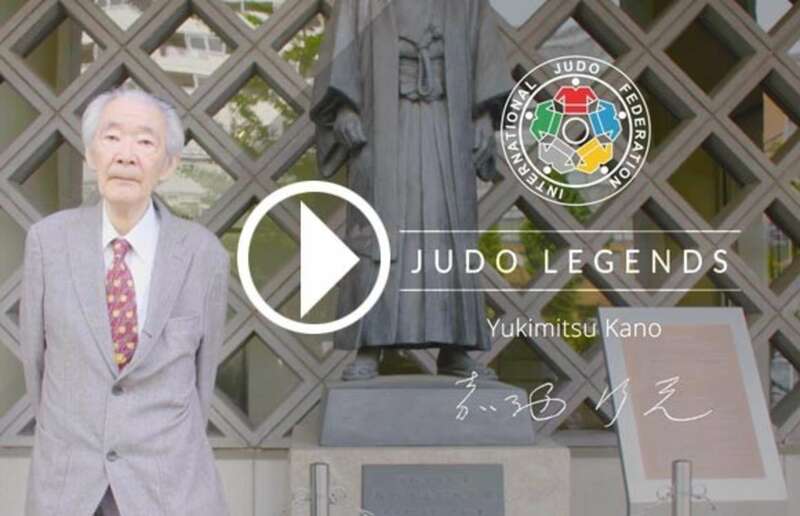 In this exclusive interview he explains his grandfather's memories and explains his own vision of judo, as Mr. Kano Yukimitsu has also played an important role in judo in Japan as well as in the world. Mr. Kano explained that when he said in front of his grandfather that he wanted to find a role model and become like that person later, the founder of judo replied: "You should not try to be like somebody else. You are who you are." This is a perfect illustration on how judo can help to build better citizens to grow a better society. Kano Jigoro was not only teaching the theory, he made sure you understood the fundamentals and he wanted his students to put his teachings into practice in society. JUDO LEGENDS: The International Judo Federation is pleased to release the fourth episode of its series of films on the legends of judo, who are above all builders of what our sport has become today. 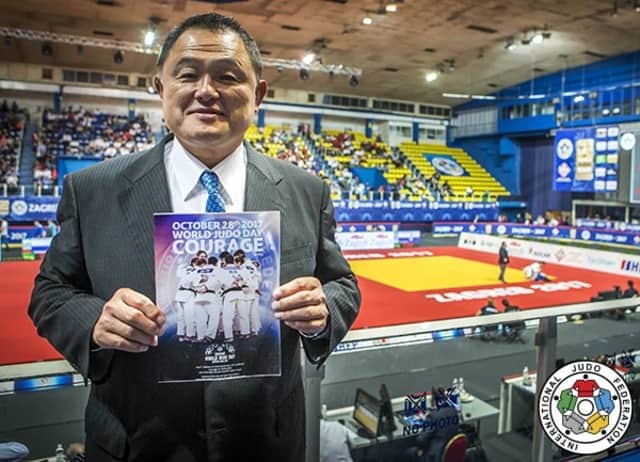 Whether they are or have been great champions, referees, and/or great leaders of world judo..., they have all contributed to making judo a major player in international sport. Over the coming weeks, the IJF will keep releasing the videos of these exclusive interviews and will unveil the messages that these personalities have to offer us. 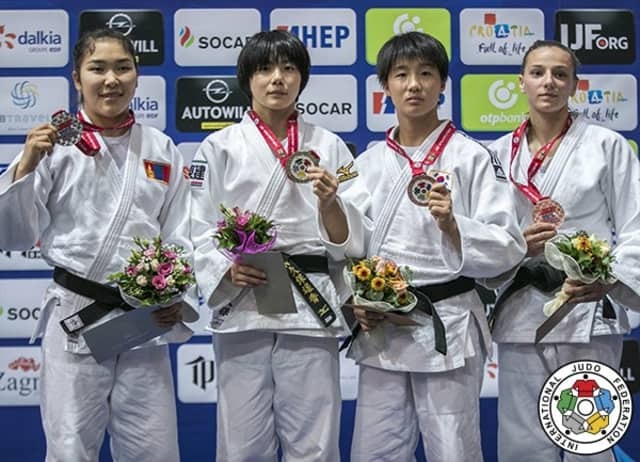 Dsseldorf Grand Prix winner ABE Uta (JPN) became the second world champion in the ABE family by living up to her billing as the -52kg favourite in Zagreb. The 17-year-old, who already has a strong presence on the IJF World Judo Tour, reverted to junior duties today to win her first world title and there could be many more to come. 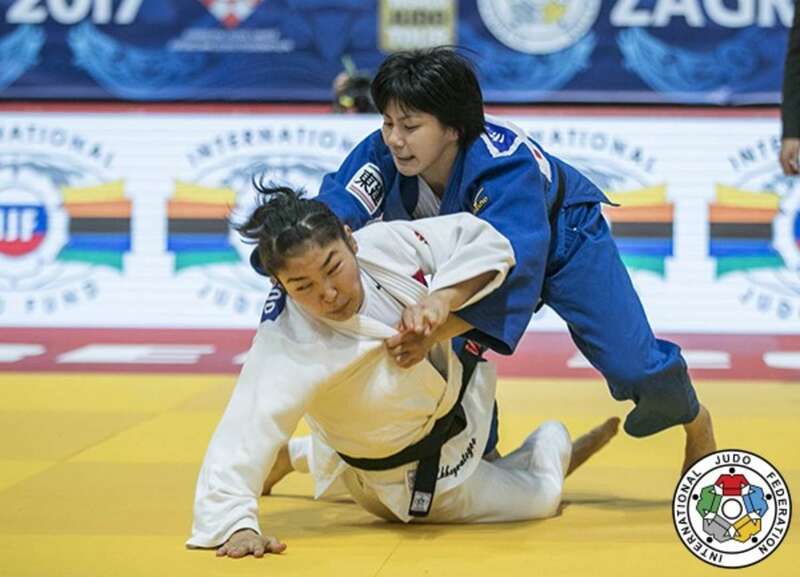 ABE had to beat her teammate and 20-year-old three-time Junior European Cup winner MAEDA Chishima (JPN) to emerge victorious and accomplished that by a waza-ari score from an o-uchi-gari. In the first semi-final ABE defeated former Ulaanbaatar Grand Prix bronze medallist BISHRELT Khorloodoi (MGL) who received her third shido with a second left in the scoreless contest. In the second semi-final Glasgow European Open bronze medallist Myriam BLAVIER (BEL) was beaten by MAEDA by a margin of two waza-ari scores. MAEDA was in total control and looked fresh as she left the tatami after a professional performance which sent her Belgian opponent into one of the two bronze medal contests. The first bronze medal was won by 19-year-old Junior European Cup winner Cleonia RACIU (ROU) who captured her country's first medal in Zagreb with a narrow win over BLAVIER. RACIU produced the only score of the contest and her waza-ari advantage saw her home for world bronze. The second bronze medal was claimed by 20-year-old Junior European Championships bronze medallist Nazakat AZIZOVA (AZE) in golden score against BISHRELT. The Mongolian was penalised in added time to gift the final medal in the category to her Azeri opponent. Defending Junior world champion FUNAKUBO Haruka (JPN) successfully retained her title with a virtuoso display as she won all five of her contests by ippon. The 19-year-old is undefeated in international competition and looks poised for inclusion in this year's Tokyo Grand Slam at the beginning of December. FUNAKUBO defeated 18-year-old former Ulaanbaatar Grand Prix winner LKHAGVATOGOO Enkhriilen (MGL) in the final with a hold down to seal -57kg gold and ensure that Japan won both women's titles on day two. In the first semi-final contest LKHAGVATOGOO defeated former Cadet World Championship silver medallist Tihea TOPOLOVEC (CRO) after four and a half minutes of golden score. A shido against the Croatian for being passive settled the contest after the Mongolian had been the aggressor in regulation time and in overtime. In the second semi-final FUNAKUBO rushed past 16-year-old Junior Asian Championships winner KIM Jisu (KOR) who received three shidos and was disqualified inside two minutes. The first bronze medal was claimed by KIM who beat 19-year-old KIM Ji Hye (PRK) by a waza-ari score. 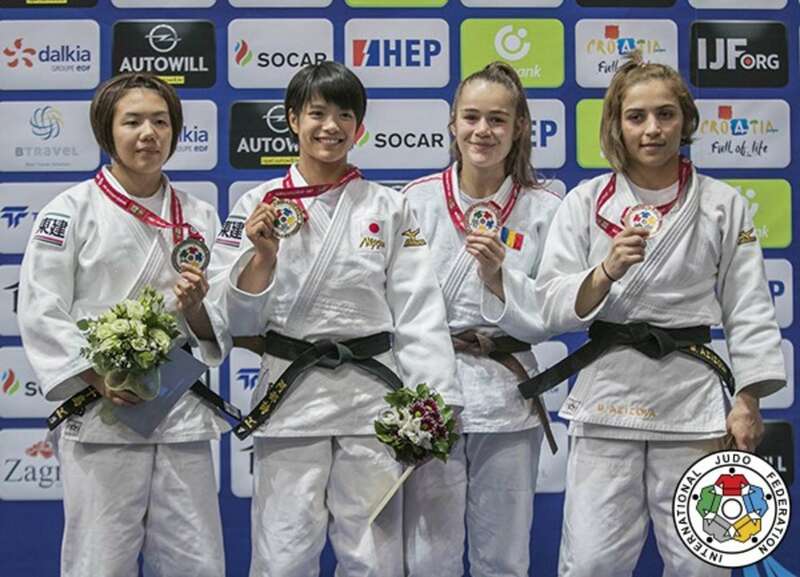 The second bronze medal contest was won by Junior European Cup winner Mina LIBEER (BEL) as home judoka TOPOLOVEC had an agonising fifth-place finish. The Croatian received a shido after four minutes and 10 seconds of golden score to send her opponent onto the final place on the -57kg podium. Junior Pan American Championships winner Daniel CARGNIN (BRA) beat two-time and reigning Junior Asian Championships winner Artyom SHTURBABIN (UZB) to win Brazil's first medal in Croatia. The 19-year-old Brazilian took bronze in 2015 but looked a new fighter today with a well-rounded set of skills which caught the Uzbek off guard with a ashi-waza movement which earned a waza-ari with half a minute left on the clock. In the first semi-final CARGNIN profited from the inactivity of former Cadet World Championships silver medallist Bagrati NINIASHVILI (GEO) who picked up a second shido in golden score to conclude a contest which was a cagey and scoreless affair. In the second semi-final SHTURBABIN (UZB) thwarted 18-year-old Worlds debutant Yagub JAVADOV (AZE) by a single waza-ari score to guarantee Uzbekistan's first medal of the competition in Zagreb. The first bronze medal was won by multiple-time Junior European Cup winner Somon MAKHMADBEKOV (TJK) who threw JAVADOV with an o-uchi-gari after 11 seconds of golden score for a waza-ari. 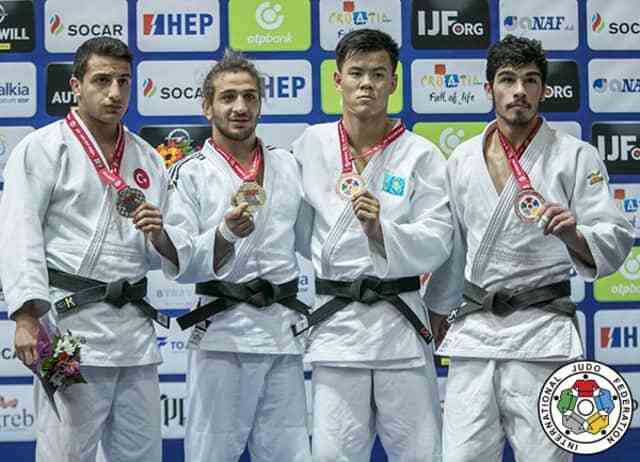 The result gave Tajikistan their first medal of the competition and there will be a belief that MAKHMADBEKOV will now become a long-term source of medals for his country. The second bronze medal was won by NINIASHVILI after an absorbing battle with 18-year-old Bucharest European Open bronze medallist Manuel LOMBARDO (ITA). NINIASHVILI found a route onto the medal podium after five minutes and 30 seconds of golden score when LOMBARDO received his third shido for passivity to receive hansoku-make. World number five and European champion Hidayat HEYDAROV (AZE) delivered on the world stage for Azerbaijan as the senior star signed off from the junior age group with -73kg gold. The 20-year-old Paris Grand Slam bronze medallist, finished fifth at the senior Worlds in August, pinned 19-year-old former Cadet European Championships winner Bilal CILOGLU (TUR) with a tate-shiho-gatame before turning to apply a juji-gatame which forced his overmatched opponent to submit. In the first semi-final HEYDAROV bested 17-year-old Junior European Championships bronze medallist Tato GRIGALASHVILI (GEO) after almost a minute of golden score. The Azeri countered his Georgian opponent with an o-uchi-gari for a waza-ari score to advance to the gold medal contest. In the second semi-final CILOGLU defeated former EYOF silver medallist Hievorh MANUKIAN (UKR) in golden score. The contest was tied at a waza-ari apiece after four minutes and golden score proved too much for MANUKIAN who received a second shido which ended the semi-final and sent his opponent into the final. The first bronze medal was claimed by Rio 2016 Olympian and former Almaty Grand Prix bronze medallist Didar KHAMZA (KAZ) who submitted MANUKIAN after three minutes of golden score. KHAMZA was as sharp in golden score as he was in regulation time and seized the opportunity for the shime-waza to Kazakhstan's third medal in Zagreb. 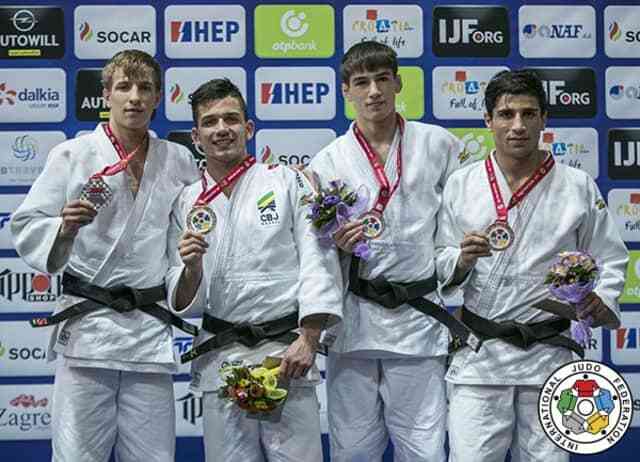 The second bronze medal was captured by GRIGALASHVILI who produced a second and match-winning waza-ari in golden score against double Junior European Cup silver medallist David LIMA (BRA).